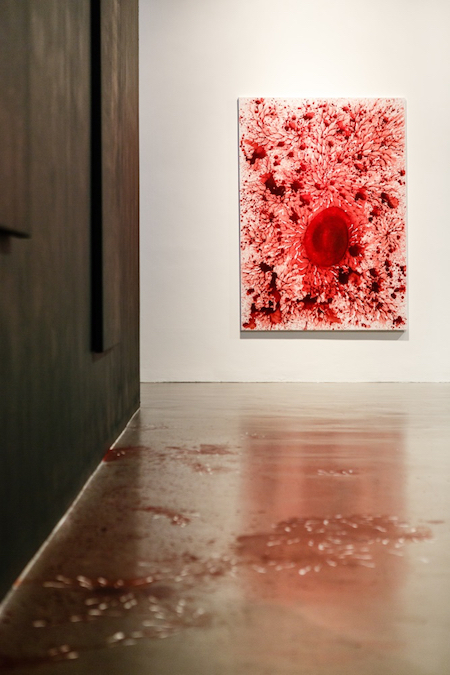 NORMALLY, TO SAY of an exhibition that the best thing about it is the lighting would be to damn it with faint praise; yet in The Exchange’s installation of Imran Qureshi’s See How the Dark of Night is Red it is the exhibition lighting which endows the works with much of their force. At the near end of room as you enter are two paintings that blend abstraction with a lotus flower patterning which characterises so many of Qureshi’s works collected here; yet thereafter the room is plunged into, if not darkness, then a far duller light. 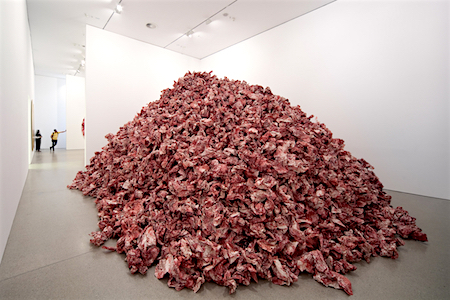 At the far end of the room spotlights then direct us to an arc of scrunched up sheets of A1-sized white paper, stained grey-red and piled up almost indiscriminately, as though to resemble bodies waiting to be tossed into a mass grave. 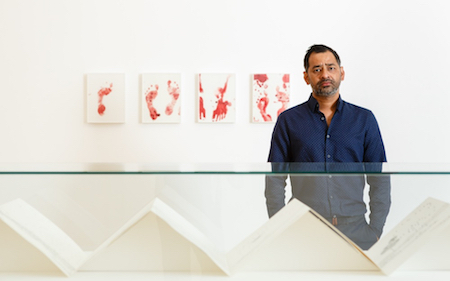 ‘And They Still Seek the Traces of Blood’, this paper installation is entitled; and the 15,000 scrunched up sheets contain the images of floor paintings Qureshi had made in Bradford in 2014 as part of the First World War centenary. 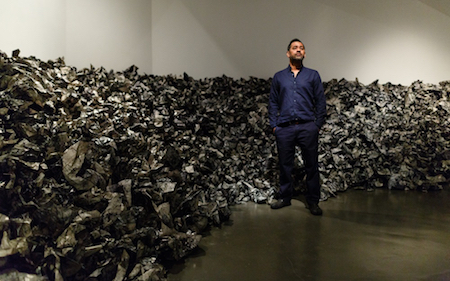 Not only does the lighting carve up the gallery space, however: individual spotlights reach down within the fissures between the scrunched up sheets, searching out depths and textures, drawing out a play of shadow and shade. As the light pools in these gaps, it directs our focus not just to the designs just about discernable from the paper, but also to the void between them. It is apt for a work that comes out of a response to the deaths of the Great War to make its viewer so hyperattuned to spatial absence. In these explosions, the paintings recall Whistler’s nocturnes in black and gold, yet it is the dullness of the acrylic which, paradoxically, most absorbs its viewer. The exhibition’s lighting serves to attune us to depth—not just within the installation, but also, and perhaps more strikingly, within the five paintings hung in the darkened middle of the room: the series See How the Dark of Night is Red from which the show as a whole takes its name. 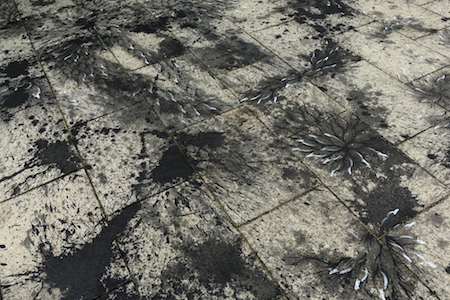 In these paintings, red acrylics blend greyed smudges and impastos with that same lotus leaf decorative pattern, upon which are superimposed explosions of white. In these explosions, the paintings recall Whistler’s nocturnes in black and gold, yet it is the dullness of the acrylic which, paradoxically, most absorbs its viewer. The opacity of the finish, the interweaving of textures and patterns, deny us any single vantage point from which to get a view of the whole. The different angles and intensities of lighting then transform this from visual enigma into somatic experience: glints and smudges respond to different angles and depths of vision, so we shift our own angle and depth of view accordingly. We step backwards and sideways in the darkness until a motif hitherto invisible discloses itself; yet one further step and once again it recedes out of focus. We become awkwardly aware of our own bodies in this space, orienting ourselves continually in the dull light. In their play of light and depth, the paintings become as much an immersive experience as the installation. Yet the most disturbing way these paintings enjoin our bodies is as the acrylic drips off the canvases on onto the floor: it is not so much that the paint has overspilled the canvas, than that the canvas now exists ostensibly as a surface for the paint to run from. But the drops of dull red paint on the floor below the canvas also recall, of course, dried blood. These are paintings where, because of the play of light and focus, we do not know where to stand; the droplets of paint that spatter the gallery floor bring additional squeamishness to our general sense of disorientation. This is particularly the case given the explosions of light on the canvases themselves. Whistler’s set of nocturnes in black and gold was inspired by firework displays over the Thames; Qureshi’s paintings respond to a different spectacle of explosion: the spate of suicide bombings that rocked his home town, Lahore, in March 2010. HOW SHOULD ART respond to such atrocities? Qureshi’s own answer in these paintings is clearly to demand an affective-somatic reaction from his viewers. It is easy to read the paintings literally, with the red paint overspilling the canvas signifying blood left on pavements, the sparks of light explosions, etc. But this would be reductive, for what is most striking about Qureshi’s works are how they incorporate different kinds of abstraction. There’s the abstraction of decorative pattern and ornament, most notably the foliage that adorns both his paintings and the drawings collected in the second half of this exhibition, at Newlyn Art Gallery. This is in open dialogue with the Persinate-Mughal decorative tradition (Qureshi was trained as a miniaturist before turning to these installations and large-scale canvases), though there are also echoes of Arts & Crafts design, reminding us that the artistic practices of West and East have long been deeply intertwined. Alongside this, and tending in the opposite direction, is an abstraction more recognisably part of post-cubist expressionist painting. This abstraction explores the opacity of medium—the acrylics, the flat canvas, the frame made porous by lighting—by dripping paint on to the floor. And coinciding with these countervailing forms of abstraction are two gestures of abstracting: the paintings both withdraw into, and reach out to abstraction; it becomes a means of shutting out the world, and of opening onto the world. If these are political paintings, then integral to their political reflection is the way they document this double, contradictory, impulse. Given the assurance with which Qureshi uses these large spaces…it is perhaps surprising to think his background was in miniature painting. 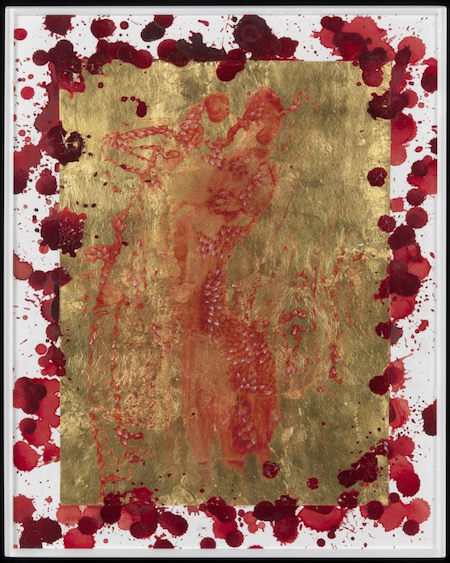 Given the assurance with which Qureshi uses these large spaces, the ways in which he continually overspills his canvases, it is perhaps surprising to think his background was in miniature painting. And yet, perhaps there is continuity here, insofar as his larger scale works arose out of a desire to extend the possibilities of the smaller medium. In an interview from 2012 he said he wanted to ‘do away with figure’ and ‘bring a three-dimensional element to the minature tradition’, that he felt ‘a strong push against the limits, in the form of a manipulation of the flat surface of the medium’. And the continuation of the exhibition at Newlyn Art Gallery demonstrates just how much continuity exists between the different scales in which he works. The large paintings retain many of the decorative details of Qureshi’s smaller works, and in particular, the merging of different forms of abstraction, gravitating alternately towards pure ornament, and pure texture. The selection at Newyln includes five watercolours from the series This Leprous Brightness, where footprints in red gouache give on to lotus flower pattern. Here too figure disperses into abstraction—either as pure ornament, or as the blotches and smudges of the gouache itself. But in turn, the blotches evoke skin that is charred, that has been hardened, suppurated: figure returns once more. In ‘Story of Two’ it is pattern itself which dissolves into blotting marks, with flecks of watery ink sprayed around the edges of the paper. Whereas ‘Hard to Understand / Heart to Understand’ merges cardiology diagrams and sketches, seemingly made in blue biro, with that recurrent red lotus leaf pattern, so that once more sinew merges with foliage, and capillaries abstract into tangled lines. 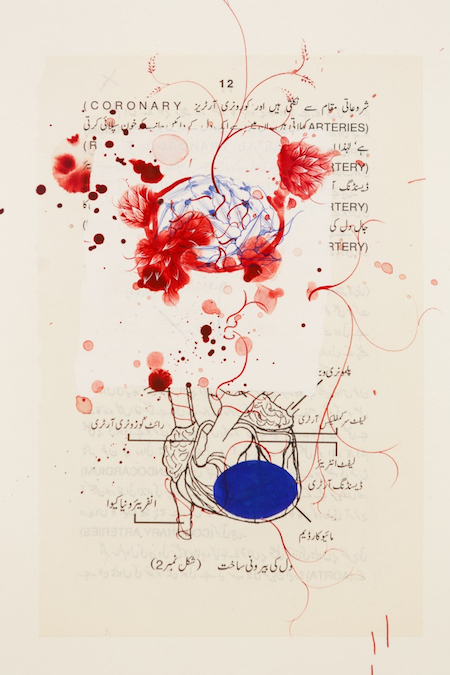 In each instance, we see Qureshi’s attentiveness to a human body transfigured by abstraction; but being so transfigured, these bodies feel but more human, closer to our own viewing bodies. This is evidently the site where, for Qureshi, any humane response to suffering must necessarily take place. David Nowell Smith is Lecturer in Poetry and Poetics in the School of Literature, Drama and Creative Writing at the University of East Anglia. His most recent book is On Voice in Poetry: The Work of Animation (Palgrave, 2015; US readers). This Fortnightly Review article is filed under the following rubrics: Art & Architecture. Publication: Tuesday, 2 August 2016, at 08:12. Options: Archive for David Nowell Smith. Bookmark the permalink. Follow comments here with the RSS feed. Post a comment or leave a trackback. ‹ 3. Gigs Gone Wrong.